Louise Bourgeois in 1990 with her marble sculpture Eye to Eye (1970). Photo: Raimon Ramis. Second generation surrealist and feminist sculptor Louise Bourgeois was one of the most important American artists of the late twentieth and twenty-first centuries. Similar to other second-generation Surrealist artists like Frida Kahlo, she channeled her pain into the creative concepts of her art. These highly charged feelings produced hundreds of sculptures, installations, paintings, drawings and fabric pieces in numerous materials. Her environments, or "cells," might include traditional marble and bronze sculptures alongside common castoffs (doors, furniture, clothes and empty bottles). Each artwork poses questions and irritates with ambiguity. Her goal was to provoke emotional reactions rather than reference intellectual theory. Often disturbingly aggressive in her suggestive sexual shapes (a distressed phallic image called Fillette/Young Girl, 1968, or multiple latex breasts in The Destruction of the Father, 1974), Bourgeois invented gendered metaphors well before Feminism took root in this country. Bourgeois was born on Christmas Day in Paris to Joséphine Fauriaux and Louis Bourgeois, the second of three children. She claimed that she was named after Louise Michel (1830-1905), an anarchist feminist from the days of the French Commune (1870-71). Bourgeois' mother's family came from Aubusson, the French tapestry region, and both her parents owned an antique tapestry gallery at the time of her birth. Her father was drafted into World War I (1914-1918), and her mother frantically lived through those years, infecting her toddler daughter with great anxieties. After the war, the family settled in Choisy-le-Roi, a suburb of Paris, and ran a tapestry restoration business. Bourgeois remembered drawing the missing sections for their restoration work. Bourgeois did not choose art as her vocation right away. She studied math and geometry at the Sorbonne from 1930 to 1932. After her mother's death in 1932, she switched to art and art history. She completed a baccalaureate in philosophy. From 1935 to 1938, she studied art in several schools: the Atelier Roger Bissière, the Académie d'Espagnat, the École du Louvre, Académie de la Grande Chaumière and École Nationale Supérieure des Beaux-Arts, the École Muncipale de Dessin et d'Art, and the Académie Julien. She also studied with the Cubist master Fernand Léger in 1938. Léger recommended sculpture to his young student. That same year, 1938, Bourgeois opened a print shop next to her parents' business, where she met art historian Robert Goldwater (1907-1973). He was looking for Picasso prints. They married that year and Bourgeois moved to New York with her husband. Once settled in New York, Bourgeois continued to study art in Manhattan with Abstract Expressionist Vaclav Vytlacil (1892-1984), from 1939 to 1940, and at the Art Students League in 1946. On June 4, 1945, Bourgeois opened her first solo exhibition at Bertha Schaefer Gallery in New York. Two years later, she mounted another solo show at Norlyst Gallery in New York. She joined the American Abstract Artists Group in 1954. Her friends were Jackson Pollock, Willem de Kooning, Mark Rothko and Barnett Newman, whose personalities interested her more than the Surrealist émigrés she met during her early years in New York. Through these tempestuous years among her male peers, Bourgeois experienced the typical ambivalence of the career-minded wife and mother, fighting off anxiety-attacks while preparing for her shows. To restore equilibrium, she often hid her work but never destroyed it. In 1955, Bourgeois became an American citizen. In 1958, she and Robert Goldwater moved to the Chelsea section of Manhattan, where they remained to the end of their respective lives. Goldwater died in 1973, while consulting on the Metropolitan Museum of Arts new galleries for African and Oceanic art (today's Michael C. Rockefeller Wing). His specialty was primitivism and modern art as a scholar, teacher at NYU, and the first director of the Museum of Primitive Art (1957 to 1971). In 1973, Bourgeois began to teach at Pratt Institute in Brooklyn, Cooper Union in Manhattan, Brooklyn College and the New York Studio School of Drawing, Painting and Sculpture. She was already in her 60s. At this point, her work fell in with the Feminist movement and exhibition opportunities increased significantly. In 1981, Bourgeois mounted her first retrospective at the Museum of Modern Art. Almost 20 years later, in 2000, she exhibited her enormous spider, Maman (1999), 30 feet high, in the Tate Modern in London. In 2008, the Guggenheim Museum in New York and Centre Pompidou in Paris exhibited another retrospective. Today, exhibitions of Louise Bourgeois' work may occur simultaneously as her work is always in great demand. The Dia Museum in Beacon, New York, features a long-term installation of her phallic sculptures and a spider. Louise Bourgeois' body of work draws its inspiration from her memory of childhood sensations and traumas. Her father was domineering and a philanderer. Most painful of all, she discovered his affair with her English nanny. Destruction of the Father, 1974, plays out her revenge with a pink plaster and latex ensemble of phallic or mammalian protrusions gathered around a table where the symbolic corpse lies, splayed out for all to devour. Similarly, her Cells are architectural scenes with made and found objects tinged with domesticity, child-like wonder, nostalgic sentimentality and implicit violence. Some sculptures objects seem strangely grotesque, like creatures from another planet. Some installations seem uncannily familiar, as if the artist recalled your forgotten dream. Femme Maison (Woman House), ca. 1945-47. Blind Leading the Blind, 1947-49. Destruction of the Father, 1974. Bourgeois received numerous awards, including a Life Time Achievement in Contemporary Sculpture Award in Washington D.C. in 1991, the National Medal of Arts in 1997, the French Legion of Honor in 2008 and induction into the National Women's Hall of Fame in Seneca Falls, New York in 2009. Munro, Eleanor. Originals: American Women Artists. New York: Simon and Schuster, 1979. Cotter, Holland. 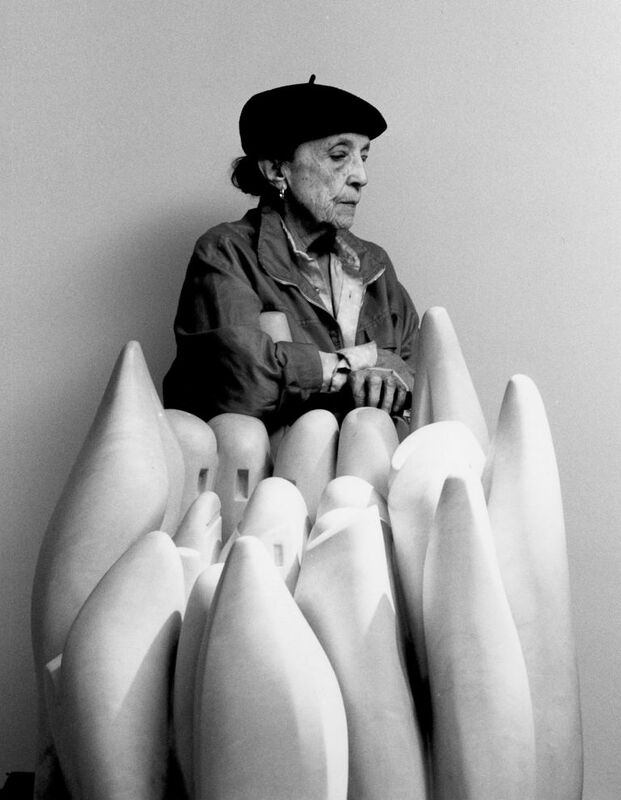 "Louise Bourgeois Influential Sculptor, Dies at 98," New York Times, June 1, 2010. 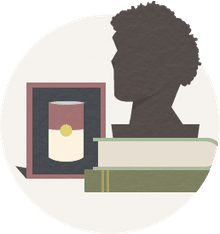 Cheim and Read Gallery, bibliography. Louise Bourgeois, exhibition catalogue, edited by Frank Morris and Marie-Laure Bernadac. New York: Rizzoli, 2008. Film: Louise Bourgeois: The Spider, The Mistress and The Tangerine, Produced and directed by Marion Cajori and Amei Wallach, 2008. Why did Romare Bearden become a collage artist? Where Did Chagall Get His Strange Ideas?